WHITE GRUB – White grubs are the larval stages of a group of beetles collectively known as scarabs (Family Scarabaeidae). While there are many different species of scarab beetles in Nebraska, the larvae of only a relatively few cause significant injury to turf. Among these are the masked chafers Cyclocephala spp. (annual grubs), May/June beetles, Phyllophaga spp. (three-year grubs), the black turfgrass ataenius, Ataenius spretulus, and most recently the Japanese beetle, PopiIlia japonica. Grubs are the larval stage of the common June Beetle. They are attracted to lights and are often observed flying around porch lights in late June through July. The grubs are whitish with brown heads and are usually found curled in a “C” shape. They feed on the roots of plants and turf. Heavy infestations in turf will loosen the sod so that it can be rolled back. The adult beetles lay eggs in July. The small grubs hatch in late July and early August, and immediately begin feeding on grass roots. As cold weather approaches, the grubs move deeper into the soil and overwinter deep in the soil 2′-3′. They move up nearer to the surface during the spring, so it is common to find grubs while digging in the spring time. Damage does not occur at this time since little or no feeding is occurring as the grubs change into beetles. What can you do to control grub damage? GRUB DAMAGE – The heaviest damage occurs in late summer and early fall after the grubs have reached second and third larval stages. The damage will appear as irregular patches of yellowed or dead grass. A normal population for grubs is considered 3 -5 per square foot and it’s common to see a few grubs in the spring. 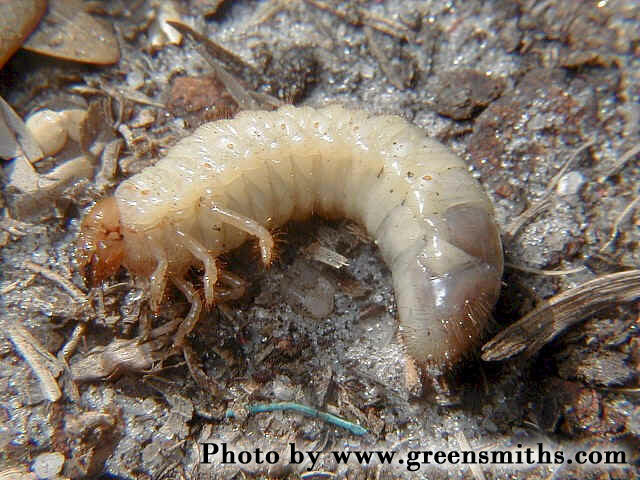 Effective chemical control of annual white grubs can be applied as a preventive grub control in late June and early July, or a chemical treatment can be applied after grub damage has been done, but is not as affective at that time. Immediately after the grub control application, water the lawn with at least 1/2″ water to move the insecticide down to the grubs. Please do not disturb grub damaged areas. Proper management of fertilization, watering often and proper mowing height will enable damaged area from grubs to recover and re-establish. Call our office if you have any further questions or concerns.